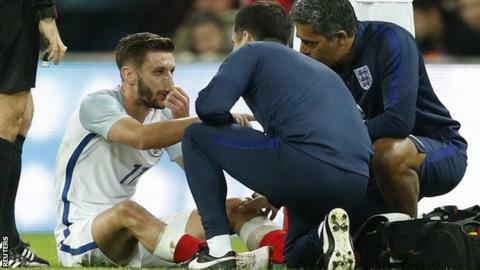 Liverpool midfielder Adam Lallana is a doubt for Saturday's Premier League trip to Southampton after limping off during England's 2-2 draw with Spain. Lallana, 28, scored the opener from the penalty spot before being substituted with a knock in the 27th minute. England interim boss Gareth Southgate said after Tuesday's match that he was unsure about the extent of the injury. "It was a great shame because I've really enjoyed working with him," he said. "He's an intelligent, very talented footballer who's adding goals to his game for England. He was quite key to how we were wanting to play." Lallana has played in every game this season for Jurgen Klopp's Liverpool side, who are top of the Premier League with 26 points from 11 matches. He has been in impressive form for both club and country, with his goal against Spain his second in as many games after scoring in Friday's 3-0 World Cup qualifying win over Scotland.